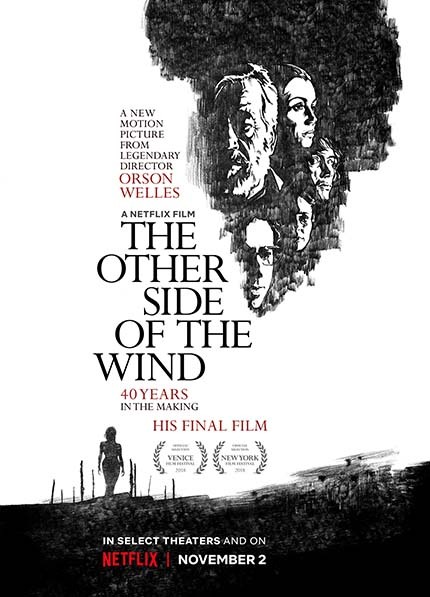 This weekend at the Venice Film Festival a fortunate few will be the first to see the last film Orson Welles made, The Other Side of the Wind. As is oft to happen, and here to even one of the greats, projects succumb to the business end of filmmaking and are never completed, lying in vaults, only existing in whispers. Welles' self financed film was shot over six years, stopping and starting for many reasons, replacing actors even after scenes were shot. The story plays like a scratched record for sure, but even someone like Welles could not snap his fingers and make a movie just appear. So here we are, some forty plus years since the last scene was shot and the world will finally get to see Welles' final film, thanks to the work of producers Frank Marshall and Filip Jan Rymsza and a dedicated restoration team. The Other Side of the Wind will premiere at Venice this weekend and Netflix will release the film theatrically and online on November 2nd. You will find the trailer below.